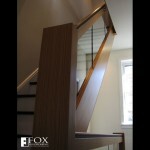 This teak hall rail provides a safe barrier along one side of a hallway in this Center City Philadelphia home. 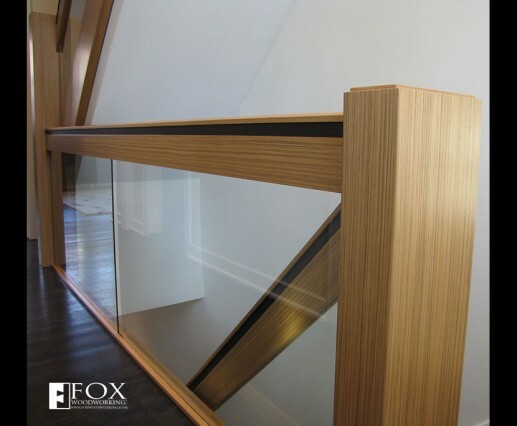 The handrail is made of solid wood that has been veneered with man-made quarter sawn teak veneer from Brookside Veneers that is nearly indistinguishable from the real veneer. 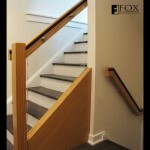 The recessed finger hold was painted black. Instead of individual balusters, tempered glass panels were used for the space between the teak hall rail and the floor.